‘White Hot’ is a variation of Hot Lips which stays crisp white in hot weather. 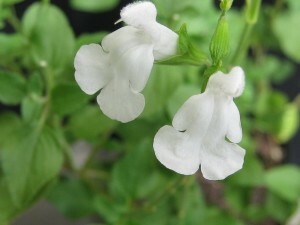 The plant is evergreen, roughly a metre high, tough to drought and frost, and adaptable. At the beginning and end of summer when it is cool it could have pink tips.